SPX - (3-5 Days)- Mildly bullish but will turn negative under 2452- For now, Wednesday managed to rally back up towards 2520 which was constructive, but after-hours selling caused a retreat back to 2477. Upside target 2548, and a maximum of 2600-30 before stalling and pulling back. Look to buy any early weakness. EuroSTOXX 50- Mildly bullish-Rally likely into 3050-3100 before stalling. Downtrend from December broken here similar to what happened with SPX and TD Sequential 13 buys were confirmed prior to the New Year. HSCEI- Bearish given the break under 9922- Movement down to 9660-5 possible with rallies back over 10250 needed to turn trend bullish. A very uneasy market to say the least with no signs that any of last year's volatility has run its course, despite being a new year. The first trading day of the new year brought about sharp spikes in both directions, and while the move up into the close yesterday seemed constructive, AAPL's after-market announcement coincided with weakness in Futures right back down again to just above Wednesday's earlier lows. Overall, not very confidence inspiring and it's imperative to be on the lookout for a reversal back lower in the days ahead. Based on the constructive close, but yet after market weakness, this creates (yet again) a very difficult tape heading into Thursday morning. Any weakness under 2452 would warrant being on the sidelines yet again, expecting that the failure of Technology to follow through has resulted in a turn back lower for stocks to potentially test late December lows before bottoming. However, it's thought that the relatively low level of stocks currently trading above their 50-day moving average as it is (12% as per Wednesday) combined with signs of fear escalating, should result in a January bottom and rally. For now, important to be on guard for any violation into end of week. Until this happens, it certainly can't be ruled out again that weakness proves short-lived and results in yet another rally attempt. Heading into Thursday, three key themes seem worth mentioning: 1) The US Dollar surge yesterday looked important and positive and is likely to result in pressure on commodities in the short run 2) EM /China weakness looks likely given this USD move, and HSCEI broke down under key support Wednesday 3) Defensives have moved out of favor yet again, which has less to do with interest rates and more of just early year positioning. The S&P rally back to 2520 proved short-lived before after market selling caused a pullback down to 2476 in S&P at the time of writing. Importantly, given the positive close in many sectors and indices, it's still early to abandon a bullish stance even with AAPL's post close jitters, which has taken a toll on US equity futures. However, a move down under 2452 would warrant a defensive stance, and this should be watched out for as a stop for longs, and sign that a move back down to test late December lows can occur. HSCEI has broken down to the lowest levels since mid-2017 as per Wednesday's close, which acts as a liquid way to view China as opposed to viewing the A-share heavy Shanghai Composite. Given the Dollar strength, and EM weakness, additional selling here looks likely which could bring HSCEI down to 9600 in the short run. REITS have begun to turn down sharply in recent days, in a move that's been strange given the pullback in yields during a time of relative market volatlity which many expected might help this sector offer some safe-haven like protection. Near-term, VNQ vs SPX as a ratio chart depicting REIT relative strength, has begun to wane sharply, and can allow for additional weakness in the days ahead. REITS should be underperformers compared to the Utility space, which despite also being weak, is a relative outperformer. Note: The Annual Review will be published later this week either on Jan 4, or Jan 7, and as such, no Weekly will be published today/Monday but rather information will be utilized for the Annual which should be forthcoming. Happy New Year to all !!! HSCEI- Movement over 3452 needed to turn trend bullish. For now premature but if markets rally into year-end globally, this very well might follow suit. Largely no change on the thesis- Continued gains are likely for the next 3-5 days into early January- Friday managed to churn both higher and lower but finished marginally unchanged with much lower volatlity than in recent days. Overall, as written in the mid-day report, S&P looks to have exceeded the downtrend from early December and is "stair-stepping" its way higher in the short run. While I do believe this trend is in jeopardy of reversing, there is insufficient proof to think we're there just yet. My opinion continues to be technically that S&P can work up to 2550-85 area and likely stalls there. If S&P gets under 2397, this would certainly change that thesis to more near-term bearish into 1/2-3. For now, its right to stay the course on this bounce. SPX on 4 hour charts shows the minor break of this downtrend, which is thought to be bullish technically speaking. One should consider still being long into year end until/unless 2397 is broken. Movement up to the 50% retracement of this downleg since early December would put S&P up near 2584 and would be a better risk/reward area to consider lightening up considering hourly overbought conditions while weekly and monthly momentum remain sharply negative. Energy SPDR ETF, or XLE, has sold off dramatically in recent months and has hit a key level of intermediate-term trendline support. Given the mean reversion tendencies of sectors to snap back after severe underperformance from end of year into February, this should be given a special look as a sector which might show some bounce as 2019 begins. Additionally, this sector looks less vulnerable given Crude's recent ability to stabilize and could "decline less" going forward given that this sector has already born the brunt of some substantial selling this year. While not a solid technical buy signal on a short-term basis it's thought that this sector could hold given XLE's pullback to this area of support. Furthermore, the "big-cap" names that dominate this index like XOM and CVX are thought to be potentially more defensive names to own after this severe pullback in Crude , and might offer some relative stability. Energy in relative terms also looks interesting after this severe pullback now that ratio charts of XLE/SPX have reached a level of trendline support undercutting lows in the last year. Given that Energy has been the worst performing sector and now entering a possible time of seasonal strength, this looks interesting to consider buying dips on this weakness. Overall, selectivity here is a must given the sharp downward trend, but it's thought that as Crude starts to turn higher, this group likely stabilizes. EuroSTOXX 50- Downside limited and expect some support near 2900 before a turn back higher. HSCEI- Mildly Bearish- A test of 9900 and slight break is possible, but expect HSCEI is close to holding and turning back higher. Continued gains are likely for the next 3-5 days into early January, as yesterday's reversal helped prices engineer one of the largest intra-day reversals seen since 2010. S&P prices at one point were down to 2397 as of 2pm EST, and now are trading 2495, nearly 100 points, or 4% higher, just since 2pm yesterday. Breadth went from -4/1 negative to flat on the day, and the early high TRIN reading of 2+ was reversed. While the news was certainly helpful as a catalyst to the gains, most cycles suggest prices should be trending up into early January before a reversal. Sectors like XLV, XLI, XLF, XLK all jumped to multi-day highs, and seem poised to continue up into year-end. Counter-trend exhaustion, meanwhile remains premature for S&P futures on most time-frames and will require a move over 2525 before starting to show any evidence of resistance being near, despite the huge price move which has just occurred. Overall, Treasury yields look poised to move higher, and should serve as a positive catalyst for Financials to begin to firm after several rough months. Overall, Wednesday's gains look temporary, yet still premature to sell. Therefore a long bias makes sense into end of year. SPX managed to close right up at its highs in a very sharp reversal higher in the last two hours of the session. This is quite bullish for the days ahead most likely, given the lack of any counter-trend exhaustion signals, and should allow for a push up to 2548 -2576 without much trouble over the next few days. Minor weakness should be bought Friday, but it's thought that prices extend. Industrials, via XLI, sold off right to key intermediate-term trendline support on the trend since 2009 and reversed sharply by the close. At $63.94, further gains look likely up to $67 before stalling. While the intermediate-term momentum is negative, for now, over the next week, a long bias looks prudent. Equal-weighted Technology vs SPX in ratio terms is on the verge of potentially breaking out of the entire downtrend which has been in place since June, over six months ago. While this has not happened yet, it's important to watch carefully, for when this occurs, it should be a very positive influence for this sector, in my view. HSCEI- Bullish- Expect HSCEI holds former lows and turns higher. S&P had its largest rally in 10 years as this stunning volatility continues, and this time to the upside. Incredibly enough, S&P was nearly in a bear market down 20% from its peaks and set for possibly the worst December of all time before Wednesday's strong surge. Breadth came in nearly 5/1 positive while volume hit capitulatory levels on the upside, over 30/1 in Up vs Down stocks. So nearly all the volume was on the upside and the TRIN hit a very low .20. Seven sectors rose more than 4% on the day, while three sectors, Energy, Discretionary and Technology, were up by more than 6%. Overall, this move likely jumpstarted the lows which should carry SPX higher into year-end. This could also make for an interesting "Santa Claus Rally" period if S&P can continue higher, setting the tone for a positive late December period which many believe has bullish implications for the following year. For now, heading into the final two days of the week, the market is in a difficult spot, as momentum has now carried back to overbought levels quickly on hourly charts, while daily, weekly and monthly momentum are sharply negative. Prices are in "No-Man's Land, having spiked into the close, but yet not back over areas of importance with regards to structure. My thinking is that the initial bounce off the lows (like what has just started) could carry a bit further, but should fail and then give way to another retest which might actually break lows heading into January. However, the degree to which prices lifted so quickly is thought to be a larger positive from a momentum standpoint in trying to put in a low. Thus, any backing and filling should translate into pullbacks to buy into. Treasuries are likely a better Short than long now with yields having gotten down to the key 2.70-2% area and reversed sharply. 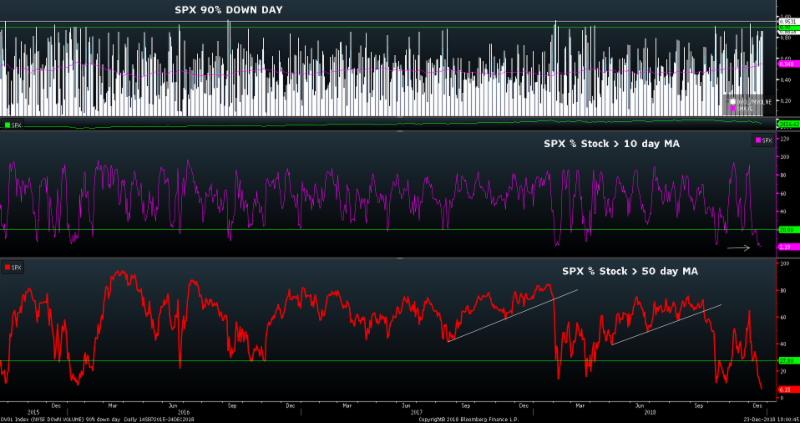 SPX made a historic leap on Wednesday, exceeding trends from the prior week and making a 5% rise off the lows. While the temptation might be to immediately sell into this, this time of month historically can show strength when a move like Wednesday has gotten underway and caught many off guard. While overnight futures might attempt to weaken a bit, technically it's probably right to stay long into end of week, expecting this to continue higher, buying dips for a push back to 2500-50 before this stalls. 10-Year Treasury yields should be watched carefully as yields got to key support at 2.71% and reversed hard in recent days. The Yield curve also steepened back to near where it broke down near 20 bps in early December. Back in late November, the divergence in yields was a key driver for equities to begin to weaken, as yields dropped sharply and equities ended up following suit. Now yields have turned back higher as sentiment has gotten far less negative. So just in the last two days we've seen counter-trend exhaustion crop up on yields and a rally back to 2.80% quickly. If yields can get over 2.85% this would break out of the entire trend and would suggest yields start to trend higher. This in turn should be good for the Financials space. Stay tuned. Crude moved quickly back up above $46 in a very dramatic reversal similar to what happened to stocks yesterday. The entire energy sector rose by 6% and this move bodes well for some additional followthrough in the days ahead. Crude would need to break out above $50 to solidify this as a real reversal of the entire downtrend from October, but we're entering a fairly bullish time for Crude seasonally, and this looks to be right around the corner. Overall, a rally up to $48-$49 looks likely in the short run, but it's worth keeping a close eye on if WTI Feb Futures exceed $50 which should generally be a real positive for the Energy sector heading into 2019. HAPPY HOLIDAYS and HAPPY NEW YEAR TO ALL !! S&P is experiencing its largest rally of the month of December 2018 today, and hourly charts show the area near 2420-5 to be important initial resistance to this rise. Overall, with breadth up more than 3/1 positive and 7 sectors up more than 2% on the day, i believe today should be important in creating a temporary low for stocks. However, it's tough to rule out a backing and filling of today and that this process might take some time until this initial downtrend is exceeded- This lies near 2435 and if exceeded on consecutive hourly closes, my thinking would be that a move back up to 2500 is underway. For now, important to take this rally one day at a time as we've experienced a huge 3% rip into an ongoing violent downtrend. Daily S&P charts show today's rally to be regaining most of what was lost on Monday's trading, so despite this feeling like a big day.. and it is. Much more needs to be done before making too much of this as a bottom. However, breadth is convincing that today does have importance. Furthermore as we've discussed in recent days, sentiment, seasonality, cycles, oversold conditions and Demark indicators all highlighted this latter part of the week as having the potential for a trading low in stocks. Happy Holidays to all! Looking forward to a safe, happy and profitable 2019! Summary: Stocks remain trending strongly downward in a trend that's nearly erased 50% of the entire rally from 2016 in S&P. Last week's "Make-Or-Break" comment was decided by the nasty "Break" on Monday which resulted in severe acceleration and resulted in the worst week of performance in a decade. The decline has begun to take a toll on the broader structures, which now show long-term trend breaks on monthly logarithmic charts from the 2009 lows. Momentum has rolled over sharply with the year-to-date decline in US indices of anywhere from 8-15% in what has been seen as a real shock to many investors given the relative lack of deceleration in the economy, or in earnings. Overall, most near-term technicals point to an above-average chance of some stabilization and bounce starting this week. However, the intermediate-term trend has also turned bearish, given the breakdown under SPX 2580 and long-term trendline breaks on many indices. However, from a risk/reward perspective, despite the bearish trend, the chance of a rally into the Spring remains high given the combination of sentiment, seasonality and some cycles which pinpoint next Spring as having some importance. Near-term, a snapback rally is expected, though with weakness likely lingering into January. With regards to bonds, a selloff here also looks to be around the corner, with yields having pulled back sharply to near key support at 2.70-2% while the Dollar index could be on its last legs, with a selloff expected to begin in 2019. Commodities meanwhile might shape up if the Dollar decline gets underway, and both Crude and Gold could have better years next year than in 2018. Overall, the volatility looks to be here to stay. Below is a table, courtesy of @Oddstats, showing the percentage returns on the last 5 trading days of the year. As one can see the last four years have been lower during this time and since 2008 we've seen six of the last 10 final five days finish down. While a bounce looks very near given the oversold conditions, it's certainly no guarantee that Santa rally carries the market higher during this time. Overview: Last week's severe decline has gone down in the record books as being the worst week since 2008 and with one more full week to go, markets could potentially record the worst December performance of all time. This current -12.45% decline already establishes December as having the worst run thus far since the 1930's with the NASDAQ now having fallen more than 22% from its peak, which many believe puts the NASDAQ in a bear market. Wilshire Associates tells us that US stocks lost over $2 trillion in value on the week, a staggering amount. Yet, this decline has been unusual to many non-Technicians as it's occurred during an economy that's healthy enough for the FOMC to have just raised rates again a fourth time this year while earnings remain sound. Thus, this decline truly calls into question the factors that many typically feel drives the market. Technically speaking of course, there have been warning signs now since late August when Technology began to "nosedive" with the NASDAQ peaking out. Breadth fell off sharply throughout much of September, with many record closes happening on flat or even negative breadth. Markets showed classic signs of negative momentum divergence on the move back to new highs as well, as January proved to be the true peak in momentum, with RSI readings near 90. When markets reclaimed and exceeded those January peaks, it occurred on far lower RSI readings. However, it was the move in the Chinese Yuan following Trump's meeting with China's XI that truly caused the bond market to turn up sharply. Yields fell quickly starting in early December and stocks weren't far behind. 5) Bullish seasonal trends- We remain in a seasonally very positive time, so a -12% decline in December certainly hasn't lived up to this standard. But in general the period from now until next Spring should allow for a counter-trend rally in stocks before the seasonality turns negative again, and for now, it's still right to consider that January- May could be positive, not negative. From a non Technical perspective, we've heard countless opinions in the media that the economy should slow meaningfully in the years ahead. The fact that many seem to have jumped onboard with this line of thinking while economic growth has been strong enough for the FOMC to continue hiking rates seems overly bearish and might represent a time when US equities and the economy generally do the opposite of what the masses believe. These are just a few reasons, but generally suggest this decline should be close to running out of steam as the market enters January. Short-term (3-5 days): Expect a reversal in trend to this decline which could happen either during the shortened session Monday, or more likely Wednesday of this week which could kick off a bounce up to 2600-2630 in S&P before additional weakness happens into January. While the trend remains very bearish near-term, we've seen the presence of very oversold conditions in the short run, with just 1% of all stocks above their 10-day moving average and just 6% above their 50-day, equally as oversold as markets were back in February 2016. Demark indicators are 2 days from signaling exhaustion on S&P, & NASDAQ and hugely important stocks like AAPL are also showing the same exhaustion signs. Thus, given bearish sentiment while markets are oversold and nearing exhaustion, it makes sense to expect some stabilization this coming week and a bounce attempt. Further weakness would take markets to 2376, the 50% retracement of the entire move up from 2016, which is an important level. Thus, while markets remain under pressure, this doesn't look like the best time to sell stocks for those with a 3-6 month time horizon. This final full week of the year should provide some clues in this regard in the next couple days. SPX nearing 50% retracement, but break of 2580 is bearish. SPX on weekly charts has now given up nearly 50% of the entire rally from 2016 and within 40 S&P points of this level at 2376. However, the pattern has grown quite bearish with the break of 2580-2600 area that most have been eyeing for weeks. Until/unless this area can be exceeded now on any snapback rally, the trend is bearish on an intermediate-term basis, with any minor bounce being used to sell. Near-term, charts have reached levels which make sense to cover shorts on any break of 2400, while traders should look at selling back into a bounce to 2600. SPX showing long-term trend break - SPX monthly charts show prices officially having broken long-term uptrends when viewing logarithmic charts, while traditional technical metrics like MACD have rolled as the signal line has been broken and MACD is diverging lower. Meanwhile, monthly RSI is not oversold. Thus, it's important to see how the rapid selling of late fits into the long-term model and as can be seen, prices certainly have gone a meaningful amount higher after having bottomed at 666 back in March of 2009. Interestingly enough, while recent selling has been dramatic in percentage terms, the decline has literally just scratched the surface in having begun to rollover. While a move back up above 2630 would cancel the breakdown, suggesting a possible move back to 3000-3060, for now the trend is bearish and bounces should be used to sell. Fear as high as early 2016- Equity put/call readings are now above 1.1, a level that hasn't been seen since early 2016 during the plunge from late 2015 into early 2016. Thus, while the selloff has proven orderly and not really shown evidence of real capitulation with regards to TRIN readings being excessive during the selloff, fear has slowly but surely returned to this market, and now we're seeing more puts being bought than calls, which is a rarity and normally signals that a bottom is near. Stocks above 10, 50-day MA hitting extremes- This chart showing the percentage of stocks trading above their 10 and 50-day moving average has gotten down to very extreme low levels as of last Friday, suggesting that lows should be near. The percentage of stocks above their 10-day has reached 1%, so 99% of all SPX names are under their 10-day, while only 7% of all stocks are trading above their 50-day m.a. Thus, the market based on this metric is as oversold as we saw back in early 2016, while traditional gauges of momentum like RSI are oversold now on daily charts. This rare level of oversold readings often will result in a very sharp bounce, and we seem to be near this time. 5 Stocks to consider buying after this Weakness- Many of these are in steep near-term downtrends, but have approached attractive intermediate-term trendline support which makes buying into this pullback appealing. The time-frame for bounces in these stocks is 3-6 months, and entries should be attempted gingerly given the extreme selling, buying in small size and adding as they start to work. Stops can be considered to limit losses to 5% in each. Charts and thoughts below. Apple (AAPL- $150.73) For the first time since AAPL peaked at $232, we're seeing evidence of counter-trend exhaustion in AAPL on both a daily and weekly basis as of this coming week. Additionally, the stock has dropped 82 points in 82 calendar days, representing nearly a perfect 1x1 price/time area where this should be close to bottoming. Near-term momentum has gotten oversold, while the stock has nearly reached its 61.8% Fibonacci retracement of the rally from 2016 and has arrived at Ichimoku support as shown by the "lookback line" hitting the bottom of the Ichimoku cloud. Overall, while the decline has been very steep in recent months, the long-term pattern remains very much intact. FedEx Corp (FDX- $158.00) FDX has gotten down to an interesting level of support worth considering after falling 29% in the last month, the worst performing stock of all the 69 companies that make up the S&P 500 Industrials index. Prices lie right near trendline support while having given back 50% of the prior intermediate-term rally. Overall, this area has importance for a possible low. The area at $154.34 represents the key 50% area, and technically given the confluence, looks to be a low risk area to consider taking positions in FDX. Goldman Sachs (GS- $160.05) GS has arrived near formidable support that likely suggests this stock can finally bottom out after a very difficult year. GS has been one of the worst performing stocks in all of the 67 stocks that make up the S&P 500 Financials index, having dropped more than 37% YTD thus far. Demark weekly exhaustion is nearly complete, and could happen within the next two weeks. Meanwhile, GS is within striking distance of 2016 lows and currently sits right on a larger uptrend from 2008, which originated 10 years ago. While the weekly charts show this to need another couple weeks, this should be close to forming a low and the risk/reward to buy has gotten better in recent weeks on this pullback. Look to take initial longs in small size and add to positions as GS starts to stabilize. Lennar (LEN- $38.96) Homebuilders might very well take a breather after a very difficult 2018. LEN stands out as one to consider after losing over 38% this year, one of the worst performing stocks of all within Consumer Discretionary. However, as monthly charts show, this area just below $40 lines up with an attractive level of long-term trendline support while also hitting lows which were made near current levels back in 2016. Weekly charts show the trend from January of this past year to still be very much down, and last week's pullback looks to require another two weeks of possible weakness before this can bottom out. However, the stock is nearing its 50% absolute retracement level from those $72 highs made back in January, so at $38.96, the area at $36 should be a very strong level which causes this to stabilize and then turn back higher. Demark indicators also are within 2 weeks of showing TD exhaustion on a weekly basis for the first time since this decline started this year. This combination makes LEN very attractive to keep on the watch list and consider buying between $36-$38 on any further weakness heading into next year. Halliburton (HAL- $25.85) HAL looks attractive from an intermediate-term basis after having lost nearly half its value this year. This stock peaked initially back in 2014 near $75 a share, so at $25.85, it's given back quite a bit in recent years and much of this has just happened in the last 10 months. Monthly charts going back since 2008 show this area near $25 to have some importance technically in adjoining a long-term support trend. TD Buy Setups will be in place by next month, and makes this interesting to consider as one to buy during a seasonally bullish time for Crude oil which typically gets underway in February. In the short run, while a bottom might take 3-5 days, this area looks appealing to initiate buys in small size and add to this as it starts to stabilize more. The first meaningful upside target lies at $38, or near the lows from August of last year which should now be important on any rise as resistance. SPX - (3-5 Days)- No change- Expecting Market low and reversal between now and Friday's close and using dips to cover shorts and attempting to put on longs selectively. Prices have undercut 2482 and now just striking distance of 2376, the 50% level, which is strong support. While downtrend is very steep at this point, it's right to cover shorts and expect a reversal from a trading perspective. S&P held up a bit better than might have been expected and despite being down below 2465 early, futures rallied up to 2487 and showing evidence that a low could be right around the corner into Quad-Expiration While the trend remains quite steep, it's right from a TRADING perspective to look for a reversal to buy into this pullback, with expectation of a possible bounce to 2580-2630. However, from an investment perspective, it's necessary that prices get back up over this 2630 area to have any hope of a larger rally into January. Technically, i'm expecting a 5-8 day rally is right around the corner, but one that likely should prove sellable into late December/early January for a cyclical low in mid-January (which should provide the framework to buy dips for a move higher into the Spring. Healthcare, Energy and Financials are sectors of interest into year end. The one key development for Thursday was the rapid reversal in the US Dollar index, which had spiked following FOMC, but faded and broke down on Thursday. This likely puts the precious metals long trade BACK on the front burner, and Deficit concerns along with a fading US Economy likely turn the US Dollar back down which should support the commodity trade also into next year. For now, commodity longs still look early until beginning of 2019 as a group, but I do think the Dollar breakdown should help the metal trade. ACTION PLAN- No need for big bets in any of the sectors that are trending down sharply, and until some evidence of stabilization and reversal, cash is a good place to be. Long Treasuries, expecting TNX gets to 2.71-2% before reversal. SPX is now within striking distance of the 2376 area, which represents the 50% retracement of the entire rally since 2016. It continues to be relevant to review this chart given the breakdown of the pattern since early this year while the larger trend on an arithmetic basis has NOT been violated. Thus, on any further weakness, this should translate into a bottom for stocks and a rally which could regain much of December's losses into next Spring. Given cyclical reasons along with bearish sentiment on the rise and ongoing bullish seasonality, there are ample reasons now to start to look for trading lows to develop in the next 2-3 trading days. However, the near-term technical deterioration remains a problem, and unless prices get back up above 2630, gains should be used to pare down longs into the new year, expecting further weakness into mid-January before any real low is at hand. DRG, the NYSE Arca Pharmaceutical index, still looks quite constructive and is one sector that looks appealing to buy on recent weakness. The Healthcare group has been one of the worst performing groups in December while still one of the best performing Year-to-Date, and Pharmaceutical names are particularly appealing given the current volatility and tend to offer a bit more stability during times of market turmoil. Weekly charts of the DRG show the attractive base in this group after the breakout, and now the test of all-time highs has consolidated a bit, offering what I believe should be a compelling opportunity to own Pharma names heading into 2019. Stocks like ABT, MRK, PFE, LLY are all quite attractive technically. Technology remains difficult to own near-term and despite many of these names down 20-30% just since October, technically we've seen a real rotation out of Tech, which looks to continue into next year. So despite there being some signs of markets potentially on the verge of bouncing entering the final full week of the year, one should use rallies in this group to pare down exposure. RSI on weekly charts of the S&P Information Technology index vs SPX broke nearly a three-year uptrend two months ago. So while many investors continue to try to "bottom-fish" in this group, many stocks remain in steep downtrends and will need substantial stabilization before thinking any sort of V-Shaped bottom occurs. Overall, it's wise to use rallies to reduce exposure in this group into next year, as relative charts have not gotten as oversold as the group was back in 2013 which represented a good buying opportunity at the time. SPX - (3-5 Days)- Expecting Market low Thursday- Friday and using dips to cover shorts and attempting to put on longs selectively. Prices have reached the target at 2482-9 in March Futures and while downtrend is very steep at this point, it's right to cover shorts and expect a reversal. EuroSTOXX 50- Bearish- SX5E closed before the US Fed decision and subsequent pullback, and expect Europe to play catchup to US and selloff to test and break 3000 on its way to 2900. Bottom line, stocks failed to turn up following FOMC, despite the rate hike, and many will start to question the Fed's actions if the market doesn't stabilize soon. This should be precisely the time to watch closely, as many investors will throw in the towel quickly, thinking that the FOMC decision was the last possible catalyst to help stocks move higher. This in turn could lead to the Capitulation for Equities that has been sorely lacking in recent weeks. Stocks have sold off in a very orderly fashion and not violently in a way that causes fear to escalate quickly. However, Sentiment polls, the VIX backwardation and Equity Put/call ratios have risen to levels that traditionally start to favor buying dips. Moreover, daily charts have seen momentum finally dip into oversold territory (No , it HASN"T been chronically oversold already like many in the Media claim) While Demark indicators are premature to show trading buys, (4-5 days away) we do see intra-day signals nearly complete on 60, 120, 180 and 240 minute charts which could be successful in helping stocks stabilize. Long Treasuries and while yields are down at 2.78-9 target, there's a small chance of move to 2.71% before reversal. Yield curve FLATTENING might last another 2-3 days before stabilizing. SPX broke down from a large reversal pattern that many are discussing as being a Head and Shoulders. Prices are now down to the first important Fibonacci level of this entire rally from 2016 lows and the area at 2500 should have some importance in providing some support to this decline in the next 3-5 days. While the intermediate-term view looks challenging right now technically given this break, any attempt to stabilize in the next couple days that results in a snapback to regain 2600 and in particular 2630 area would be seen as a real positive for the short run. The 50% level lies near 2376 and is something to consider important under 2450 as a legitimate target. For now the next few days are very important as to how this pattern turns out and worth paying attention. SOX, the Philly Semiconductor index, broke sharply in recent days and should be watched carefully as the SOX performance tends to have some major implications for the Tech trade. Near-term this break looks to challenge 1100 and get slightly below into Friday, but from a trading perspective, it's right to considering covering shorts in SMH by end of week given the extent of this move and structurally. 2/10's curve has flattened out as expected post FOMC and now within a few days of signaling Demark exhaustion. This likely can put a temporarily floor in this flattening in the yield curve, so despite the intermediate-term view of the curve flattening to 0, I doubt this will happen in a straight line. One should consider closing out Flatteners given the extent of the move yesterday and feel like the curve starts to stabilize here and 10, 30 yields are close to turning back higher. SPX - (3-5 Days)- Mildly Bearish into Wednesday, but expecting LOW in Stocks Wed-Friday of this week with optimal targets at 2510-3 for SPX and max target on this first go-around at 2482-9. Important to let this decline run its course, but SPX looks to be getting close to support in price, and time. EuroSTOXX 50- Bearish, (No Change) expecting test and mild violation of 3000 into Wednesday before bounce, with 2900 being important as an area to consider covering shorts and trying to buy dips. If prices manage to get back above 3128, that would change the thesis to mildly bullish. Stocks failed in several different bounce attempts yesterday and yet again, turned lower to test the prior days lows. Overall the trend remains strongly bearish near-term, but signs of near-term oversold conditions are nearing (not there yet, despite what the media says) while counter-trend exhaustion should arrive by Thursday/Friday of this week. Additionally, time cycles project this week to be a turning point and given the decline, should be a low for stocks for a bounce into year end. Finally, sentiment continues to worsen, and Equity Put/call has now reached levels coinciding with prior market bottoms. (REVIEW)- SPX is now closing in on time targets from the peak in September (90 days- always important) along with 45 days from 11/7 highs, 60 days from 10/17 lows and 315 days from the 2/9 lows. Given my reliance on time angles of the circle to show confluence for turns, this is about a strong of a lineup from prior highs and lows that we can find heading into a given week like this, while Demark TD Sequential and TD Combo signals are now present with exhaustion TD 13 buys on 60 and 120 minute charts. While not wanting to stand in the way of any downside acceleration, there are price targets at 2533-45 for SPX and below would take prices to 2479. Meanwhile, a reversal back up over 2583 has minor positive importance. Charts and analysis below. SPX finished right near prior days lows, and is extended down to its lower Bollinger band while nearing a target that would allow the initial trend down from September to equal the most recent decline from November in price points lost. This often can be effective possible near-term turning points in the decline and key support for this target lies from 2482-9. Above however, is another closer area of support that could be effective on any decline post FOMC which lies at 2510-3, and based on projections from the September highs. Bottom line, it's right to be defensive, but a few indicators based on momentum and time could allow for this initial decline to bottom out by Friday. Thus for traders, it's right to try to buy into this pullback, despite fighting the downtrend, given some of the positives mentioned above while SPX enters a very bullish seasonal part of December following one of the worst starts to this month in over 80 years. US 10-Year Treasuries should extend gains into Thursday/Friday before reversing, but yields are getting down to targets to sell Treasuries on this recent decline in yields and the area at 2.78-9 looks ideal to take profits in longs and consider going the other way. The yield curve meanwhile has steepened ahead of the FOMC, but technically looks susceptible to reversing course and should be vulnerable to flattening back out in the weeks ahead. Healthcare has been one of the weakest sectors in the last week, following the overturn of Obamacare by the Texas Federal Judge last week. Many expect this decision to be reversed, and technically charts tend to agree. The trend in Healthcare vs SPX had gotten a bit extended into November before this reversal took place as this ratio chart shows above of XLV/SPX. Overall, Healthcare remains quite attractive to own in relative terms and should be overweighted vs the market. However, this pullback looks to extend near-term and stocks like BIIB, HUM, ABMD, MCK, UHS, LH, SYK, CI, and WCG are better shorts than longs in the next 2-3 days before these bottom out. SPX - (3-5 Days)- Mildly Bearish into FOMC - Weekly Technical Perspective thoughts of rallying might be postponed until FOMC with key time frame for trend change at 12/19-12/23, which hits this week. Until SPX shows a rally back over 2583 on a close at a minimum, it doesn't pay to stand in the way, though near-term lows look near & should happen in the next 3-5 days with fear starting to spike. Can't rule out move to 2482-9.. but don't feel anything more into FOMC or beyond and would look to buy weakness this week. EuroSTOXX 50- Bearish, expecting test and mild violation of 3000 into Wednesday before bounce, with 2900 being important as an area to consider covering shorts and trying to buy dips. If prices manage to get back above 3128, that would change the thesis to mildly bullish. Very tough to be all that constructive from a pure price basis alone after seeing Monday's decline, which violated 2583, a level that had held as a daily close back in April and also February of this year. 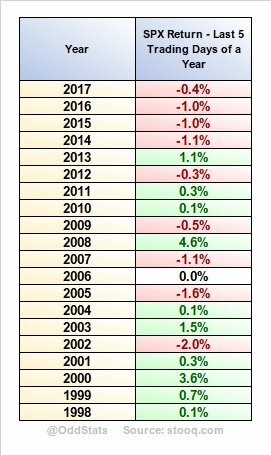 So, despite SPX finishing about 10 points higher than intra-day Feb lows, yesterday's close proved to be the lowest since last Fall, finishing down lower than any other close in 2018, as this December's first few weeks have proven to be the most negative in over 30 years for this time of year. Volume rose, and breadth was fairly negative at 6/1 Decliners outweighing advancing issues, yet volume didn't really flow at all that capitulatory of a manner into Down stocks vs Up in trading. The later decline was far worse in terms of breadth than the early bounce attempt into Europe's close and we saw 10 sectors close down over 1% on the day, with Financials being one to close "less bad"
Bottom line, yesterday's selling didn't change my opinion that this week has the potential to produce a reversal. However, given yesterday's breakdown, it's a MUST that SPX get back over 2583 sooner than later and ideally over 2631 to have confidence. Sector-wise we started to see some of the stronger Defensive sectors give way in a broad-based fashion to join the others, which normally can happen towards the end of the pullback. Yet, volume still seemed not too overbalanced in Down vs Up issues. However, Equity put/call did finally rally to near 1 on the close, which is the highest levels we've seen since last Spring. Therefore, while capitulation might have been lacking volume wise, sentiment is definitely starting to favor a bullish bounce is approaching. Overall a very tough tape and one that's closing in on time targets from the peak in September (90 days- always important) along with 45 days from 11/7 highs, 60 days from 10/17 lows and 315 days from the 2/9 lows. Given my reliance on time angles of the circle to show confluence for turns, this is about a strong of a lineup from prior highs and lows that we can find heading into a given week like this, while Demark TD Sequential and TD Combo signals are now present with exhaustion TD 13 buys on 60 and 120 minute charts. While not wanting to stand in the way of any downside acceleration, there are price targets at 2533-45 for SPX and below would take prices to 2479. Meanwhile, a reversal back up over 2583 has minor positive importance. Charts and analysis below. Structurally speaking, the break of 2583 was certainly not a positive technically. My thoughts last week were that this area could be retested given the Transports, Small cap and Financials weakness, but this breakdown needs to be recouped to have any hopes of a larger rally. At present area, prices are right at the February lows, and Equity Put/call has jumped to levels that formerly have shown market bottoms. Thus, from a pure pattern perspective, the charts are ugly near-term. Yet, sentiment is starting to finally get to levels which make sense to buy this dip, and cycle-wise this week has some real importance given its distance from both September highs and also February lows. Thus, I don't want to be a seller of stocks this week, but as scary as it seems, a buyer. Yet, it's right to be hedged and not be too cute on buying dips until we see proper stabilization. Two areas of importance for any bounce: 2583 and then 2631, each of these being important based on the pattern of the last couple months. Between now and the FOMC, further weakness does seem possible based on Monday's close, yet I feel the majority of the downside is behind us in the short run, technically. Thus, one can either avoid the trend until it stabilizes (and miss buying the lows) or try to buy dips in the next 2-3 days, which might require holding on during a couple big days of volatility, but I expect to ultimately prove correct during the balance of December into early January. Defensive selling during a "bad" tape is not something which normally is all that common, except during the latter stage of a move when the leaders turn down and the market capitulates. That process looks to have begun with yesterday's decline, and with yields closing in on support near 2.80-2%, and with equity indices nearing (what I believe) should be a trading low this week, selling Utilities, REITS, Telecom based on yesterday's weakness looks prudent as all of these groups look to move lower near-term. WTI Crude made a fairly meaningful pullback yesterday, violating the pattern from October to move back to new lows. This selling likely takes Crude down to $48, its first meaningful area where prices can stabilize. The pattern shows the ongoing churning while remaining in this downtrend which typically signifies one final pullback to finish a certain move before reversing course. That move looks to have begun yesterday, so a bit more weakness is likely Tuesday/Wednesday but should be close to an area where its right to buy dips in Crude. Overall, near-term trends based on yesterday are negative technically and require a move back up above $51 to have any real confidence of a false breakdown. EuroSTOXX 50- Mildly bearish but Europe starting to show evidence of some outperformance vs US just as Draghi announces an end to QE. Expect 3115-20 proves important and allows for a minor pullback, and over 3248 needed to be constructive. HSCEI- Increasingly more positive and HSCEI has held up relatively better in recent days and weeks. Willing to own in small size, using dips to add to longs. Movement above 11077 needed for a larger bullish stance. Three straight days now where prices have closed down under the day's open, yet prices are still up +0.5% from Monday's close. An odd market in the short run, with lots of moving pieces and some violent sector rotation taking place. Overall, the fact that the DJ Transportation Avg, XLF (Financials ETF) and Russell 2k have broken down to new low closes for 2018 suggests that a bit more weakness is likely into next week's FOMC. However, some interesting price action in the Equal-weighted Technology sector in the last week, which has strengthened, despite some of the large cap Tech still being under pressure. We'll expound on that in a chart below and more over the weekend, but this is a promising development for Tech which carries quite a bit of weight when looking at the possibility of this sector starting to stabilize a bit, which could lead to the long-awaited Santa Rally. Financials also have been showing some internal developments, as The Brokers and Insurance have both been outperforming, and on an Equal-weighted basis, Financials as a sector has not been hitting new lows, despite the weakness in XLF. Demark signals on weekly charts show this sector to be close to trying to bottom out in the next 2-3 weeks, which likely coincides with a larger Treasury yield rally. Overall, given Thursday's movement, a small short bias looks right into next week, but underweighting Transports, Financials and Small-caps near-term and looking to buy into any dips given the chance into FOMC. While the market has been under pretty constant pressure since early December, it's insightful to view the QQQ pattern which has begun to show some signs of stabilization and making higher lows, vs plummeting to new lows like we've seen with SPX in making a deeper retrace, or in IWM moving to new lows. This bodes well for the market in the weeks to come most likely given the start of a bit of relative strength in the NASDAQ vs the broader tape. Overall, one would use movement back up above 7100, or 173 in QQQ as being quite positive for a larger rally. But the ability to hold up well above mid-November lows is also thought to be a positive and at least one thing for Bulls to "hang their hat on"
Small caps remain a tough area in the market, breaking down to new lows vs the QQQ in the last day. For those wishing to have relative shorts, Small-caps via the IWM still looks like a viable option and preferred technically vs selling the QQQ. This breakdown looks to continue in the days ahead and should be taken as a signal to avoid IWM, both relatively speaking here, but also on an absolute. While XLF has moved to new lows for 2018, the IAI has begun to outperform KBE in a pretty dramatic fashion in recent days. This ratio chart shows the breakout in IAI vs the Banks, the latter which largely has been dragged down by Regionals lately. Stocks like SIVB, TREE, RF, KEY, STI, WBS, HBAN have all been down by more than 8% in the last week. Meanwhile, Stocks like PJF, GHL, MKTX, and LAZ have all be positive in the rolling days, serving as a bullish influence (or less bearish) for IAI. Overall, this breakout looks to continue in relative terms, so when looking amidst this sector, IAI should be overweighted. SPX - (3-5 Days)- Still willing to lean bearish into FOMC until/unless S&P gets above 2687 -Yesterday's rally largely failed where it should have and backed off into the close with two back to back days of 1% declines off early highs. After hours bounce on May win failed to help S&P regain 2687. Overall, it should still pay to sell "rips" and buy "dips"
EuroSTOXX 50- Sell into yesterday's bounce to 3107. Bearish with target at 2900, the 50% retracement of the entire move up from 2011. Rallies will need to get back over 3125 to have any real confidence of a low at hand. HSCEI- Mildly Bearish- Bounce in last couple days still prone to failure, unless 11077 is exceeded.Target 9900-10100 sometime this week before stabilization and then rally in back half of December- Pullback not as severe as US and should be used to buy- HSCEI has been strengthening vs US relatively , so recent weakness is not expected to break October lows. Yesterday's gains looked quite similar to Tuesday's, yet by end of day, S&P backed off again, more than 1% off early highs. While end of day gains still finished positive and trended higher post close on May's Survival vote, the trend sure seems to be having trouble in making any sort of meaningful rebound. As mentioned in recent reports, a move ABOVE 2687 on a close is necessary to fuel any market bounce. For now, despite the minor rally in Technology, the group remains under pressure, along with Financials, accounting for over 40% of the SPX. While Healthcare has been persistently strong, leadership from Tech is thought to be important if indices have any chance of turning December around. Thus far, the month is down nearly 4% and the year as a whole turned negative in the last week, lower by -0.84% (SPX) through 12/12/18. The late day Theresa May confirmation could cause the Pound to bounce further in the days ahead ,and this should be important to watch given that the US Dollar has wobbled of late. If the Dollar starts to break down, this should serve as the catalyst for commodities and specifically, Precious metals and Grains, to continue their recent bounce. The commodity space is thought to be quite attractive heading into 2019 given that many expect a slowing economy which would put downward pressure on the US Dollar. For Thursday and Friday, it's tough using one days' gains to fight a downtrend which has been ongoing since early December, but it's right to watch carefully if 2687 is surpassed, as this would lead to further gains into year end before a January decline. As mentioned, it's important to see Tech stabilize and for now, Technology remains quite weak and VIX has firmed quite a bit along with widening credit spreads. The back to back 1% pullbacks off early highs just aren't that inspiring. For now, the benefit of the doubt still goes to the Bears. Despite yesterday's gains, prices closed well off highs yet again, after a 37 point decline from Tuesday's highs, they closed down 34 points from Wednesday's highs to finish at 2656, only 9 points up from Monday. Heading into Thursday, the two straight days of selling off substantially from early highs , over 1% each day, this still casts some understandable doubts as to the longevity of any bounce which seems to be having real difficulty. Overall, heading into Thursday/Friday, a close over 2687 would warrant being long for a move to 2730. Any decline back UNDER 2636 at this point warrants a retest of 2583 and slightly under heading into next week's FOMC before any meaningful rally. Technology on an equal-weighted basis, peaked out in June and recently turned down sharply at a time when it was threatening to possibly breakout headed into late November. Thus, despite yesterday's strong gains in Tech, it's important to put things in to perspective and realize how much this group will need to rally to truly get the group back on track and help the market. At 20% of SPX, we'll need to see meaningful strength to break back out above this downtrend and help engineer a larger stock market rally. Healthcare, our best performing group of 2018 still looks quite attractive in relative terms on a monthly ratio chart vs SPX. The breakout of nearly a dozen year base consolidated before turning back up in mid-2018. Thus, at a time when Technology has waned, Healthcare still seems to be the risk-on group to favor outside of the Defensive groups, particularly the Pharmas during times of volatility like what has occurred. SPX - (3-5 Days)- Bearish with movement above 2687 necessary to turn constructive for a larger rally. The 40 point decline off the highs is a concern as Financials, Small-caps, Industrials remain weak, and could lead to a 3-5 day decline to retest lows one final time in December before a rally. For now, Insufficient proof of a low at hand. EuroSTOXX 50- Bearish with target at 2900, the 50% retracement of the entire move up from 2011.Rallies will need to get back over 3125 to have any real confidence of a low at hand. HSCEI- Mildly Bearish- Target 9900-10100 sometime this week before stabilization and then rally in back half of December- Pullback not as severe as US and should be used to buy- HSCEI has been strengthening vs US relatively , so recent weakness is not expected to break October lows. As yesterday's Morning Technical Comment stated.. Trend bearish, but over 2645 could lead to 2675-80 and requires a move back ABOVE 2682 for any sort of conviction for a low at hand and larger rally. The early morning bounce promptly reversed from this 2675-80 zone, falling 40 handles in S&P to real make-or-break areas of support. Overall, it's thought that the failure of S&P to close under its OPEN in S&P Futures and falling 40 points off its highs, could set up for a final pullback in December to test last week's lows at 2583. Demark counts look to require additional 3-5 days of pullback, and sectors like Financials, Industrials remain in tough shape technically with DJ Transports hanging on for dear life right at former lows. Small-caps continue to underperform and have broken down further vs SPX in the last couple weeks. To this last point, this isn't necessarily a bearish omen for stocks, as markets showed similar deterioration from 2015-6 and just coincided with minor equity weakness, though larger bull markets do in fact peak with a slide in Small-caps and Mid-caps to kick things off and that seems to be happening now. Three interesting things look to be happening which are worth mentioning: Consumer staples are breaking out to the highest relative levels since early 2018 relative to SPX, something which bodes well for further outperformance (Note, the two stocks recommended Monday in the Weekly Technical Perspective from this sector as part of the Attractive Defensives- PG and CHD) Second, the US Dollar index is shaping up for a final push higher into late December, something which could coincide with a minor reversal in the recent Gold and silver rally, and put near-term pressure on commodities right ahead of the 2 year anniversary of the US Dollar peak post US Election. Third, the 2/10 yield curve looks to be collapsing, something which is coinciding with severe Financials underperformance. This could continue also in to FOMC and keep US indices under pressure for 3-5 days until markets stabilize post FOMC. Bottom line, during this volatile period, Defensives look attractive and are far more stable than trying to pick lows in Technology, Financials and Industrials, no matter how compelling these stocks look. It's imperative for these latter groups to start to shape up a bit and near-term, trying to play the swings in Equity index futures isn't for the timid. Right now, markets still look to be under pressure. And no need to try to catch the lows, though that's what we'll try to do here. But some sense of trend improvement is truly necessary before weighing in too positively. Happy holidays. SPX's near-term trend remains bearish and despite being near the recent 2600 lows in what many thought could provide a bounce, we saw a very sharp 40 point reversal down from mid-day highs. While exceeding 2645 was thought to be a minor positive, it was essential for S&P to climb up above 2682 to have any chance for starting to turn higher. That didn't happen, and prices closed down under yesterday's open, which opens up the possibility of further weakness into FOMC next week before any stabilization. Near-term, it's right to stay defensive and avoid the temptation of trying to pick bottoms until indices can stabilize. Only a close back over 2687 warrants a long stance on a close. Until then, it's better to look for the chance at covering shorts near last week's 2583 lows, which might be breached by a small amount before markets can turn back higher. Consumer Staples finished at the highest level relatively yesterday in nearly a year, pressing up out of its recent consolidation. This should allow for further relative strength out of this group in what has become a very defensive December. The two stocks written up Monday morning in the Weekly Technical Perspective as long candidates, technically, CHD and PG, both look attractive for further gains. For those with eyes on the Yield curve, we look to be completely breaking down into next week's FOMC. At 10.5 bps, yesterday's movement doesn't suggest any type of stabilization near-term, but suggests additional downside pressure in the yield curve, and it's right to play for a further flattening out ahead of next week. Yesterday's close was the lowest of the year, arguing for additional near-term compression. This likely also continues to put pressure on the Financials space, which most likely will underperform into FOMC before bottoming out ahead of year-end. SPX - (3-5 Days)- Bearish until/unless 2645 is exceeded, which would lead up to 2675-80, the larger area of trendline resistance. While yesterday's About face was more positive technically than prices closing down at the lows of the day, still not too much conviction of a low in place. and prices are in No-Man's Land. Overall, a move in Futures above 2645 would be a positive for a move up to 2675-2680. However it's thought that a close over 2682 is really necessary to help S&P start to climb back over the balance of December. For now, a snapback rally like we saw yesterday is no guarantee of any real low at hand. There remain sectors like Financials and Transports which closed down near lows of the day and Small-caps were equally hard hit, so the minor rally in Technology for Monday was a positive, but was definitely offset by declines >1.4% in both Financials and Energy. Outside of Equities there was some evidence of the Dollar turning higher near-term with the British Pound having broken down to the lowest levels since last Spring on Brexit complications. Until we can see the Euro and Pound start to stabilize a bit more, it will be tough to expect too much of a commodity rally, and the Dollar could turn up for another 2-3 weeks into late December before turning down. This would mark a runup into a prominent two-year anniversary, and should be watched carefully this month. SPX structure has not yet broken down based on yesterday's ability to rally up off early lows after 2600 initially was violated. This area between 2600 and 2682 is largely considered "No-Man's Land" . While it seems difficult to get long after a 60 point rally which remains trending down from early December, it's also getting tough to be short and withstand these violent whipsaws. Overall, groups like Utilities and Telco both managed gains and might be better than attempting to pick bottoms in Market indices. British Pound Sterling v USD dropped to the lowest levels since last Spring yesterday which coincided with the DXY turning back up sharply from key support and commodities withering. Near-term, it will be difficult for the Dollar to turn down as thought possible in December until we see some stabilization in the Pound and also Euro. For now, Demark daily signs of exhaustion are present, yet nothing on weekly charts and will take another 3-5 weeks before any meaningful weekly low. Thus, any bounces in the days ahead back up above 1.26 would likely be a chance to sell, for pullbacks lower to 1.20 before this holds. Overall, a US Dollar peak likely could materialize near 2 year anniversary highs in late December. SPX - (3-5 Days)- Mildly bearish with above-average possibility of stalling out on Thursday's late day bounce attempt. A crash seems doubtful given the spike in Put/call, and breadth/momentum are better than a few weeks ago. Bottom line, pullbacks into early next week should be used to buy. EuroSTOXX 50- Mildly bearish with target at 2900, though Thursday's move left prices stretched. Rallies will need to get back over 3125 to have any real confidence of a low at hand. HSCEI- Mildly Bearish- Pullback not as severe as US and should be used to buy- Test of 10188 and even 10000 is possible but should be used to buy, as China is relatively stronger than US. Overall, Yields still look to trend down to 2.80-2% into early next week before Treasuries peak out(yields turn back higher) For now, the Dollar has stalled out on its rally but hasn't turned down all that sharply just yet. Oil has slipped back down to new lows, but yet shows evidence of strongly positive momentum divergence that should signal an upcoming low in price. Looking at Europe, there was a very strong breakdown under 3100 for SX5E, and this will be increasingly important to pay attention to, with prices down at six-year trendline support from 2012. Sector-wise, it's important to watch Financials carefully in the upcoming days/weeks, as Demark's TD Sequential indicator has flashed a 13 buy signal on XLF/SPX after the recent sharp weakness with TD Combo right around the corner. Any upturn in Financials would be quite positive for the overall market, and this sector has already experienced severe weakness and should be close to turning back higher into next year. SPX hourly charts show the area at 2695 as being important to this picture given that prices have risen to fill the gap from the prior trading session. These areas can often serve as support and resistance and should be respected as the first real area of importance on the upside that could hold after yesterday's comeback. However, given the extent that VIX and Equity put/call spiked, any further pullback likely will prove buyable. SPX weekly chart shows 2600-22 being the true "line in the sand" for longs and until broken, it's tough making too much of a larger bearish case for equities based on index prices alone. (The individual stock is down much more, and a different story indeed) Until/unless 2600 is violated, the structure since this time last year is more representative of a larger neutral pattern, and breaks of the minor uptrend which occurred in October, appear to have been contained. Movement back higher is a possibility into year end as well as next Spring before any larger weakness gets underway. Put/call ratio on Equities has quickly gone from the lows of the yearly range to the highs in the matter of one week's time. This is important for those looking for lows, as readings had been largely subdued of late, but the spike back to new highs indicates the start of real concern, and from a contrarian point of view, makes for an easier time buying dips during times of fear. Overall, trading lows in stocks look likely sometime next week, and weakness back to the lows into next week should coincide with a chance to cover shorts and consider buying, as opposed to expecting a larger crash. EuroSTOXX 50- Bearish- Pullback to test 3100 underway- Under will lead to 2900. HSCEI- Bearish- Test of 10188 and even 10000 is possible but should be used to buy, as China is relatively stronger than US. The structure has definitely begun to get worse in the last two sessions. The minor bounce failed and now has taken out yesterday's lows. So patterns are suggesting a possible retest now of prior October lows after two failed bounce attempts. While an uptick in fear could hold prices near 2600-22 this go-around, the structure looks increasingly like one that will breakdown eventually given the deep retests. We'll need to see a rally back up ABOVE 2764 to have any sort of confidence that lows are in, which at this point, is nearly 100 points higher. SPX Futures have made a very deep retest and unless regained in the next few days, ie.. a Thursday/Friday move back OVER 2764, this suggests an eventual breakdown, which would undoubtedly violate the trend from 2016. Overall, while the sentiment is starting to turn quickly with lots of disgruntlement and talk of the economic recovery turning, the price action is not giving lots of hope right now, with such a deep retracement. Overall, one should buy into the retest, technically. Yet any break of 2600 is a big negative, and would necessitate hedging/shorting and/or avoiding until markets can stabilize a bit. Europe, aka, the Euro STOXX 50, or SX5E is in much worse shape than SPX and pulling back to test prior lows after just a minimal bounce. one can see the breakdown in October of a lengthy base and recent retest also failed. The deep retracement should allow for a test of 3100 and eventual break to 2900. Crude oil turning higher pre OPEC Thursday and looks poised to move to the high 50's. While the larger trend will need a larger move above $58 to think the intermediate-term trend can change, one can make a case technically that the next 3-4 dollars should be up based on this recent alignment. SPX - (3-5 Days)- Minor bullish for a bounce to 2729 with 2696 stop on longs- Overall, bounces likely prove sellable near-term based on yesterday's weakness.. and additional 3-5 days of weakness possible near-term before decline runs its course. Expect to stabilize by end of week with 2655 being important. A couple key points, as yesterday's selloff caught many, including myself, off-guard. After a 6% move in six trading days higher for SPX, we erased nearly half of this yesterday. The positives revolve around momentum being positively sloped on daily charts, DESPITE yesterday's decline. Additionally, we saw the first instance of some capitulation in volume with heavy volume on the downside vs upside which has been sorely lacking for months. Yesterday's TRIN reading of 3.3 was the highest reading since January as volume swelled into declining vs advancing stocks by nearly a 15/1 ratio. While this doesn't 'have' to signal a bottom, particularly if it occurs near the highs of the range (See Dec 2015 for example) it does look meaningful and has been lacking of late. Overall, the spike in Chinese Yuan which coincided with Treasuries lifting and the yield curve plummeting to near inverted territory has certainly caught the attention of many of late. While this negative turn in sentiment could be important coinciding with a capitulation in volume, we arguably are still a bit low in Equity put/call after this got very compressed into this week on last weeks rally. Additionally, the VIX wasn't as high as it could be either. For now, there's a small window where it looks right to buy dips into this pullback given the bullish seasonality (though that really hasn't worked that well this year) and bearish turn in sentiment. But any break of 12000 in NY Composite would be a concern to the bullish case (See charts below). So a bit of wiggle room for the next 3-5 days, but it's imperative that we don't have another few days like yesterday, as this would suggest the start of another move to new lows. Stay tuned. QQQ decline was worse than might have been expected coming into yesterday, undercutting this downtrend that had been exceeded, and momentum remains positively sloped on daily charts. Thus we see a violent 3.5% decline following 6 of 8 days higher, which had carried prices up to the tune of nearly 9%. For now, this isn't a sufficient enough decline to think prices have to revisit lows. Additionally, given the recent capitulation in volume yesterday, we should be closer to a near-term bottom which can give way to a Santa rally before any larger selloff next year. The next 3-5 days will be key. For now, no rush to buy dips immediately, but it's imperative that some type of stabilization start to happen in the next few days and NOT get back to prior lows. The NY Composite has acted very much like the SPX in recent weeks, with a choppy, but volatile pattern. Yesterday's decline hasn't yet broken levels that argue for immediate deterioration, and 12,000 would be important to hold to keep the chances for the Santa Rally alive. Bottom line, 12000-12223 leaves not much wiggle room for the bulls. Thus a good risk/reward to consider buying dips with a "Stop and Reverse" on any close back under 12,000. Gold is starting to perk up again and looks attractive as this has broken a minor trend and stretching up towards monthly highs. This began to strengthen early in the week as yields plummeted while the Dollar stalled out.. Two important pieces of the puzzle that typically warrant overweighting precious metals. Near-term, this looks to push higher to 1270-1300, but until 1375 is exceeded, it's difficult to have too much conviction just yet on this being anything more than just a near-term bounce. One can buy IAU and GLD and look closely for signs of GDX starting to bottom out in the near future. EuroSTOXX 50- Mildly Bullish, Expect Europe can rally up to 3280-3300, but that remains its first real test, the area of the prior breakdown. December started off with a real Holiday surge given the Trade War truce announcement and yesterday's gains likely pave the way for further upside in stocks into next week. Breadth finished at nearly 3/1 bullish while Energy, Discretionary, Technology, and Materials all closed higher by more than 1.5% on the session. WTI Crude along with Grains both closed meaningfully higher, while Treasuries continued their recent positive correlation with Equities as both moved in tandem yet again. Yield curves plunged on 2/10 down to the lowest of the year, while inverting when looking at 3's/5's and directly coincided with underperformance in groups like Financials. For now, this trend of stocks and bonds moving together looks to continue. While Financials had paved the way for market gains over the last week ahead of this past weekend's announcements, it was the Materials and Tech stocks which directly benefitted post Truce news. However, the most important move looked to happen outside of US and directly with Emerging markets, as China's HSCEI broke out of a trend which has led prices down much of the year, while Emerging market ETF's like EEM broke out of similar trends. This looks bullish for this style group and EM likely can show some further outperformance near-term, which would accelerate on evidence of the US Dollar turning down more forcefully. For now, the pullback in yields while USD stagnates has been sufficient to coincide with a lift in EM as China warms up to the idea of a tariff "cease-fire" . NDX's breakout worth following near-term, as prices got above important resistance near 6950 and likely to challenge and exceed 7200. Many Tech stocks showed evidence of stabilizing near-term and AAPL's ability to close up near highs of the session in particular was thought to be a bullish development which warrants sticking long this stock and Technology as a whole for a holiday bounce. Under 6839 necessary to stop out longs and postpone the rally. Emerging markets are showing compelling technical evidence of trying to turn higher, as yesterday's trendline breakout was the first meaningful move above long-term trendline resistance since late January of this year. This suggests the potential for some gradual strength in the EM space, and one should consider being long EEM with targets near $44.80. US 10-Year Notes have begun to show larger evidence of rallies of late, and the breakdown in the long end of the curve with 10 and particularly 30 year yields has caused many yield spread combinations to go sharply lower (flattening out ) While the 3s/5/s curve inverted yesterday, the 2s/10s curve has fallen to new lows for the year. This looks important, but for now, very much premature to make too much of until this inverts. (Even then there has historically been a significant lag between when the Yield curve inverts and economic conditions deteriorate. For now, additional flattening in 2/10 curve looks probable. SPX - (3-5 Days)- Upside should still prove limited as overbought situations remain and yesterday's late day push did result in some negative divergences. Look to buy pullbacks to and buy back under 2700. EuroSTOXX 50- No change in Europe- Mildly Bullish, Expect that Europe might to play catchup with US, but Europe far weaker and upside likely limited in the short-run up to 3263 before consolidating along with SPX. The final trading day of November is upon us. We've seen S&P claw back to register a near 1% gain for the month thus far, while NASDAQ is down for November, lower by 0.45%. The Dollar has gained ground, Bonds are showing evidence of near-term rallies (given 10yr yield break) . Commodities have gradually withered given the USD rally and Crude remains hovering around $50 after its sharp pullback, while Gold has disappointed bulls, despite the negative sentiment. Meanwhile Cryptocurrencies have experienced a horrific decline after breaking support which goes against their normally bullish seasonal tendencies in November/December. Overall, a great month for traders, but genuinely difficult one for most investors, and tough for many to have conviction given the possibility of tariff escalation and Powell seemingly set to continue rate hikes, though cleverly coming off a bit more dovish after his recent talk. Overall, yesterday's pullback was largely disappointing for the bears and finished largely unchanged, but yet stalling out in a fashion that seemed likely technically speaking after the big 100 point S&P run-up to the tune of 4% over 3 days. We've seen Financials and Healthcare dominate in outperforming lately while Technology appears to be slowly but surely firming. Momentum has improved in Stock indices and MACD has turned back to positive following one of the best weeks in the last couple years for DJIA. In the short run, some additional work needs to be done to have confidence that equities have begun a "Santa Rally" 2750 is key for S&P and getting above that would help prices push higher to the all-important 2810-5 area. While breadth and momentum have improved on better price action, momentum remains overbought, and this juncture near 2750 still seems to be difficult to claim is something to ignore. When weekly and monthly momentum are negative and prices have gotten overbought on intra-day bases, that typically represents the most challenging of environments. My technicals suggest that this should be the start of a seasonal push higher, and not just a minor bear market bounce that should lead back to lows right away. Near-term, further stalling out looks likely, though on a breakout of 2750 in SPX and 6950 in NDX, one has to respect that, and think that kicks off the rally into year-end. Sentiment certainly appears to support this idea, as it remains much more bearish than usual for the end of November. Overall, a mildly bullish stance is recommended, looking to add to bullish exposure on any pullbacks into the early part of December. Some charts that try to make sense of recent movement are shown below. NDX has pushed up to near key downtrends from October, similar to SPX. This would seem to be decent resistance. Yet, momentum has turned positive on this move given how strong a push higher we've seen. Thus, on any backing off in the days ahead, this should allow for dips to be bought, vs thinking a larger selloff down to lows should occur. Movement over 6950 would be positive for NDX and this should be watched carefully for evidence of trend acceleration, given that December is approaching and sentiment remains negative. Pharmaceuticals look increasingly attractive of late, considering the breakout back to new high territory. Yesterday's Cup and Handle breakout in the DRG is quite positive for this group, and quite a few stocks like LLY, MRK, TMO, PFE, and others have been breaking out technically in a fashion that suggests this group should continue to lead. Near-term, one should overweight this part of Healthcare and look to add on dips if given the chance in the days to come. US 10-Year Treasury yields have begun to trend in the opposite direction of how they've traded vs Stocks for the last couple months. As this overlay chart shows, both yields and stocks peaked on 10/3 and then bottomed in late October. Then yields peaked on 11/7 along with stocks and trended lower. Lately, stocks have rebounded this week, however, while 10-Year yields have broken down. Given this prior relationship, it might be early to suggest this divergence should simply lead to stocks and bonds starting to rally in unison again. For now, stocks have not rolled over, and TNX appears to have broken down under prior lows. This doesn't suggest an immediate trade, but simply to be cognizant of this relationship when it starts to diverge. SPX - (3-5 Days)- Upside limited between today and early next week- Look to short 2750-1, and buy back under 2700. EuroSTOXX 50- Mildly Bullish, Expect that Europe might to play catchup with US, but Europe far weaker and upside likely limited in the short-run up to 3263 before consolidating along with SPX. An absolute "Melt-Up" yesterday following Powell's speech, with broad-based participation and decent breadth of over 4/1 positive. Nine sectors out of 11 finished up at 1% or greater, while five sectors, Consumer Discretionary, Healthcare, Technology, Industrials and Telecom, finished up greater than 2% on the day. Technology led the way, which was encouraging, but something discussed over the last few days as being a possibility given the setup in NASDAQ and counter-trend Buy signals in Equal-weighted Tech vs SPX. S&P has surged up to the next real area of resistance, found between 2745-2751, which as shown on this 240 min chart, lies right near current levels. 4-hour charts show the presence now of TD Sell Setups while RSI has moved to the high 70s however, indicating that near-term upside is likely to prove limited. From a trading perspective, it's right to consider lightening up between today and Friday, and for aggressive traders, to short movement above 2750, as there likely will prove to be strong overhead resistance. (This might make sense for those wishing to take risk off ahead of this weekend anyhow) Though most of China, as shown below, is in good technical shape, so the extent of any selloff might prove limited for now. For S&P, downside could take prices to 2700 or below to 2685, but should be buyable. The key will be to keep an eye on breadth and momentum over the next 3-5 trading sessions. For now, despite a decent near-term breakout in AAPL, the SPX appears to be near key areas to consider selling. Eurozone stocks, shown by EZU, or officially, the Ishares MSCI Eurozone ETF, have also begun to improve similar to US and Asia and look buyable for a move higher in the weeks ahead, potentially finally starting the Santa Rally. While US has gotten near-term overbought, this breakout in EZU argues for longs in Europe for the first time in the last few months. Rallies to the low 40s look likely and dips in the next week likely prove to be buyable as prices have broken out of the trend which has been underway most of the last six months. Ahead of this weekend's G-20 summit and the Trump/President Xi dinner, Chinese Technology looks to be turning higher, which is directly coinciding with improvement in China's HSCEI and SHCOMP indices. This could very well mean that negotiations are in order as opposed to Tariffs and/or that the tariff escalation does not happen as planned. Many of the companies in this group, shown by Invesco's CQQQ, or the China Technology ETF, include weightings of BABA, TCEHY, BIDU, NTES, have begun to stabilize after severe declines in recent months. The daily chart of CQQQ shows this breaking out above a downtrend which has lasted most of the year. Many fundamental analysts have been pounding the table on this area all year as being undervalued, but this is the first time for most of 2018 that the technical picture is starting to change for the better and argues that being long this space is correct. One can buy CQQQ with targets initially in the mid-$50's and stops at $42.